Do you want to hike along a stunning National Trail in the UK? Well, the Jurassic Coast walk is a real treat, a trek that takes you through thousands of years of history. To a time when dinosaurs roamed, hence the name, the Jurassic Coast! 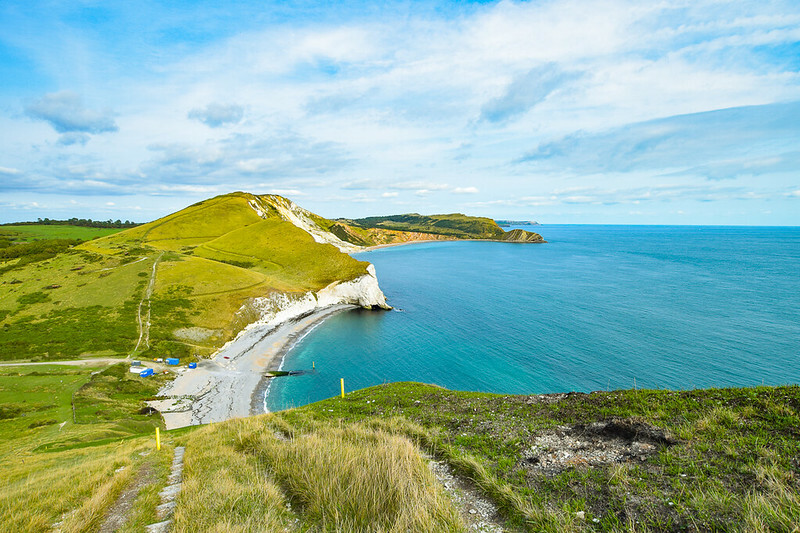 The Jurassic Coast was the first natural UNESCO World Heritage Site. In 2001, the coast from Exmouth in Devon to Studland in Dorset was given this prestigious title. And rightly so, it’s a stunning natural wonder in the UK and should be preserved. Tourists visit popular sections on this famous stretch of coast which is dotted with cute seaside towns along the coastline. But to appreciate the beauty of this entire World Heritage Site walking is by far the best way to enjoy it. I walked the Jurassic Coast during one long-distance hiking trip and wild camped along the route. Of course, that doesn’t mean to say that’s the option you have to do too! There are plenty of options for staying in hotels, B&Bs and campsites which are also dotted along the route. Here I will share the Jurassic Coast path route I took and mileage each day. How long is the Jurassic Coast walk? The Jurassic Coast path is part of the South West Coast path (the longest trail in the UK) which starts in Minehead and ends not far from Studland at South Haven. Although the coastal stretch is 95-miles long the walk is a few miles longer, due to cliff erosion in numerous parts along the route. The full length that I hiked (according to Strava) from Exmouth station to Studland in walking miles was over 100 miles (Not sure I trust Strava 100% though!!). The Jurassic Coast walk can be done as one long-distance walk or if you don’t have time to complete the walk in one go (or don’t want to) then you can complete smaller sections of the Jurassic Coast too. How hard is the Jurassic Coast hike? Completing the hike in one go is a tough challenge. There are plenty of difficult sections and steep climbs along the route but also some lovely flat sections in between to make up for it. Want to make it easier? 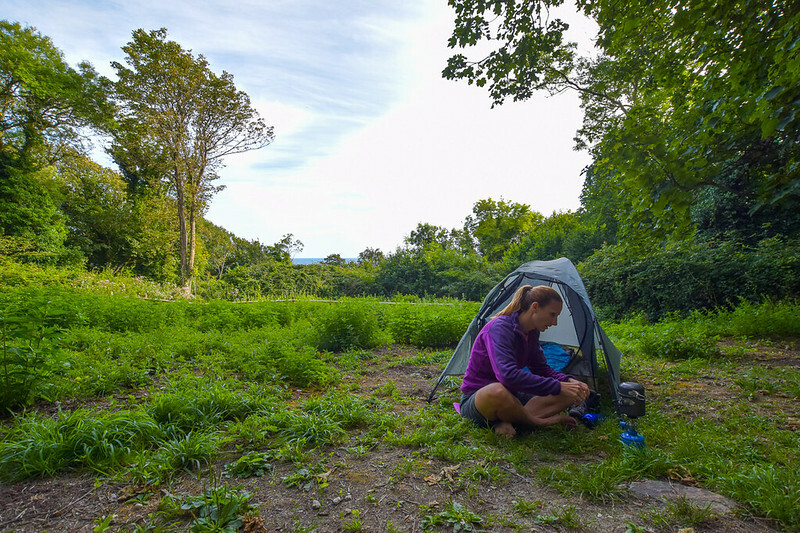 Hike shorter days or stay at hotels, B&Bs and guesthouses so you don’t need to carry full camping gear. How many days does it take to hike the Jurassic Coast (all 95 miles)? 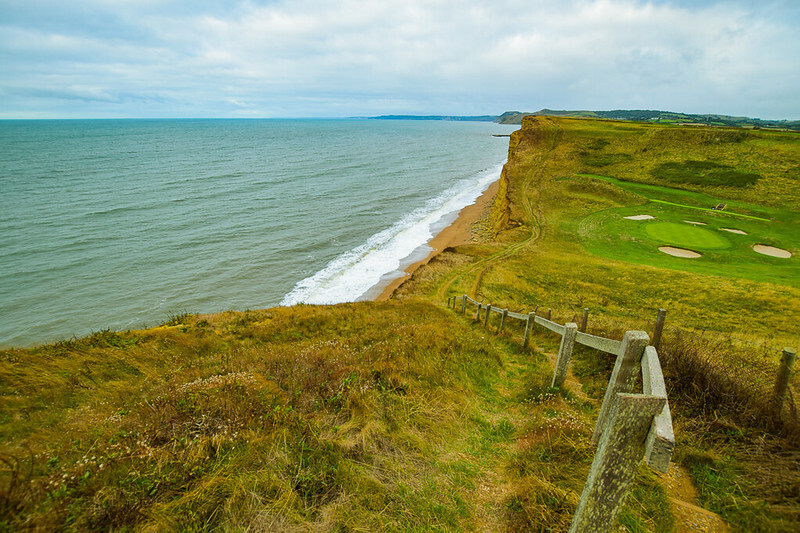 The Jurassic Coast walk can be completed in as many or as few days as you like! If you want to complete the hike in the shortest time then 5 days is the quickest you could do it, which would mean 20+ mile days. Below I’ve broken the walk down into nine stages. When planning your Jurassic Coast hike you will need to consider how far you want to hike each day and also where you are going to stay. Hopefully, this breakdown will give you the information you need to plan your Jurassic Coast adventure! The start of the Jurassic Coast walk is close to the seaside town of Exmouth. More than likely you’ll either be arriving by public transport so factor in some extra time to get to the official start! Exmouth train station is about a 2-mile walk to Orcombe Point. Here you’ll find a huge information board about the Jurassic Coast and its World Heritage Site status. At the top of the cliff at Orcombe Point, there’s the Geoneedle which signifies the start point of the Jurassic Coast. Interestingly the Jurassic Coast covers three periods, the Cretaceous period (65-145 million years ago), Jurassic period (145-200 million years ago and Triassic period (200-250 million years ago). The evidence of the Triassic period, once a vast desert with huge sand dunes, clear from the red cliffs in East Devon. Fossils from the Jurassic period found between West Dorset and Portland. Finally, the Cretaceous period where crocodiles, dragonflies and dinosaurs roamed the earth. Now evident from the tiny skeletons of plankton in the sea of Purbeck area. 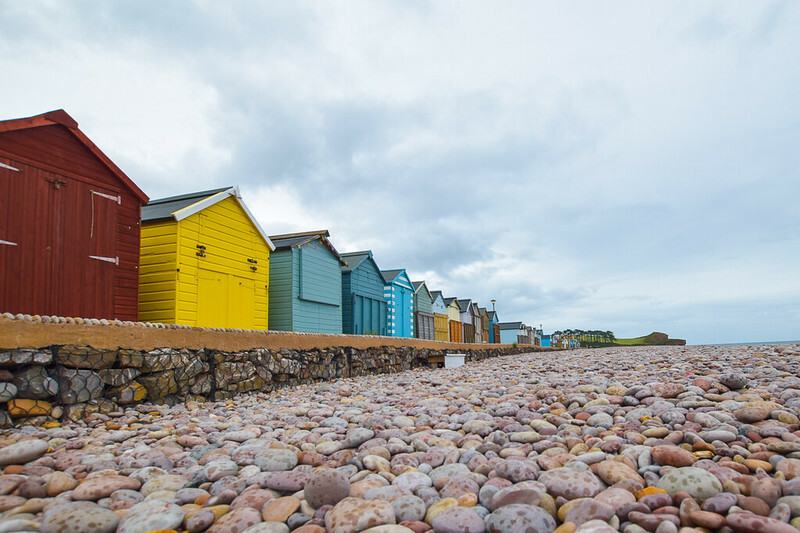 At Budleigh Salterton, the coastal path takes directly next to the beach with colourful beach huts. Then shortly after, you walk around Otter Estuary Nature Reserve, there are a couple of wildlife hides that you can stop and do some birdwatching. Also, it’s perfect as a mini shelter if it’s pouring with rain! From Otter Estuary Nature Reserve it’s about 3 miles to the next refreshment stop at Ladram Bay. 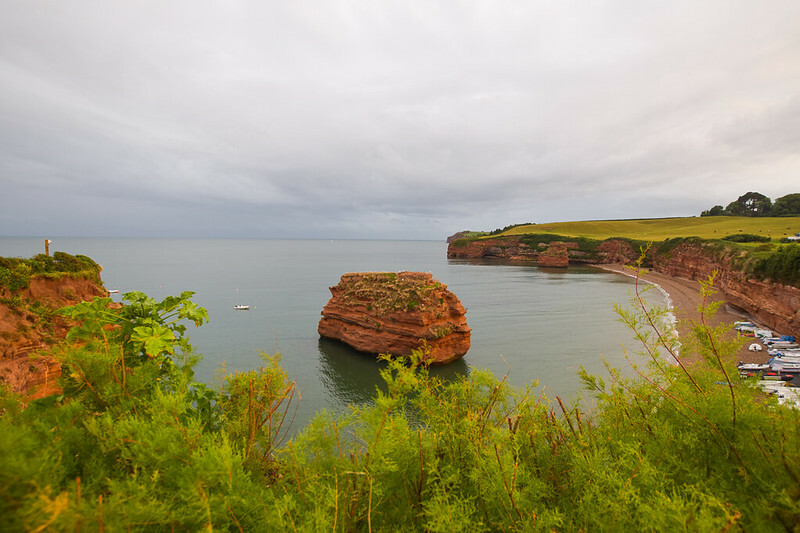 The striking red cliffs continue along the section of the Jurassic Coast walk and make for some stunning photos. Arriving at Ladram Bay, a huge holiday park. It’s a little overwhelming in peak season since it’s popular with families but there are some stunning red rock formations in the sea. A great viewpoint is High Peak (not technically on the path but you can get some beautiful views across to Sidmouth from the top. Take some binoculars with you, if you can fit them in. These pink ones are pretty cool! From the town of Sidmouth, you very soon back high on the cliffs overlooking the sea. With luscious green fields and trees contrasting again the red cliffs. As well as a few friendly fields of cows too! If you’ve followed my Instagram Stories you’ll know I’m terrible with cows when I’m out walking but these cows seemed relatively unphased by me! The Jurassic Coast section between Branscombe and Beer is a popular hike for people staying at Beer and nearby Seaton. You will meet plenty of people walking between the two since there are refreshments close together which is perfect for a short hike. After Branscombe, you’ll notice the cliffs changing from red to white chalk cliffs. The cute town Beer was a haven of activity and a great place to stop, for a beer of course! The route to Seaton via the beach is not accessible at high tide. Also, the coastal road is not accessible as a diversion so you have to go on more of a detour. I was lucky and timed my walk so I could cross the pebble beach and large rocks. This section takes you away from the views of the coast for the majority of the walk. There’s even a sign saying that for a 7-mile stretch be prepared for difficult terrain and no facilities. Be sure to fill your lunch box with lots of goodies for this section of the hike and fill your water bottles up too. To begin with, it seems relatively tame, walking across fields but you soon are in what can only be described as a mini jungle section. The lush green plants, trees and moss and growing all around and it really feels like you are in the movie Jurassic Park. This section takes 3-4 hours to get through and it’s unlikely that you will meet many people but that adds to the charm of this part of the walk. 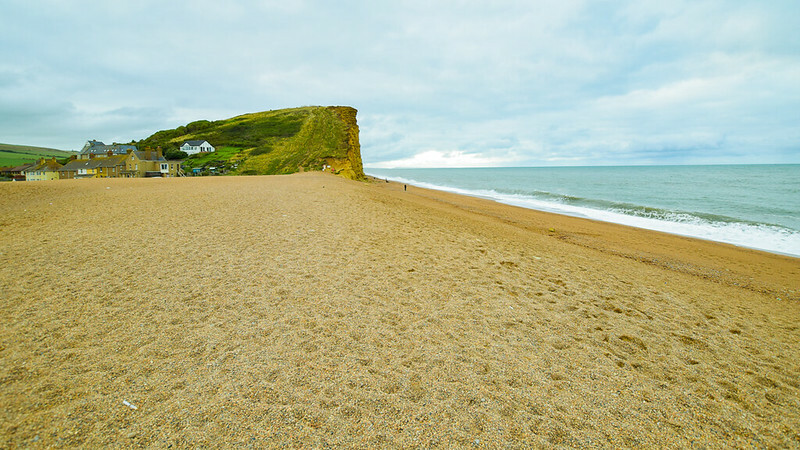 Famous beach at West Bay – aka Broadchurch! From Lyme Regis, you need to follow the path, up around the town, following the path as it diverts you. It is easy to start following the path that takes you alongside the coast but you do need to go on a slight detour. Charmouth Beach is a great spot for fossil hunting, although on my hike this day was heavy rain and winds so not the best weather for searching for fossils! If you’re interested in monitoring the changing weather on the coast then you might like the ClimeMET Handheld Wind Meter. From Charmouth, you are back walking on the cliffs and reach the Golden Cap which is the highest point on the Jurassic Coast and on a clear day, there are stunning views. Sadly, the day I hike I didn’t have a view. But always a reason to go back! Back from the cliffs, you reach the small town of West Bay. For those UK fans of Broadchurch, you should be able to spot a few famous places from the TV programme. Walking poles are handy for this section of the walk. I used them for most of the hike since I was carrying a heavy rucksack but hiking uphill the trekking poles give you an extra hand. You can read about the poles that I use here. On leaving West Bay you walk around the small harbour, then you automatically have the iconic cliffs from the TV show Broadchurch in front of you as you walk up the beach. Taking another detour inland towards Abbotsbury, it’s a change of scenery but just as beautiful walking across the English countryside! Arriving into Abbotsbury, there’s plenty of tourist attractions including a maze and Abbotsbury Swannery so if you’re stopping here for a rest or your night’s accommodation you will enjoy plenty to do as well. The cafe has a great choice of food to refuel as well. Leaving beautiful Abbotsbury you then have a very long section, which is pretty similar. Both a highlight and a lowlight was Chesil Beach, 29 km long it’s spectacular but as you’re hiking on it you don’t really get the aerial view. Plus hiking along long sections of tiny pebbles is pretty tough going. The next section takes you inland for a large section. This was my least favourite part of the Jurassic Coast walk, mainly as the scenery was relatively flat and I couldn’t see the sea! 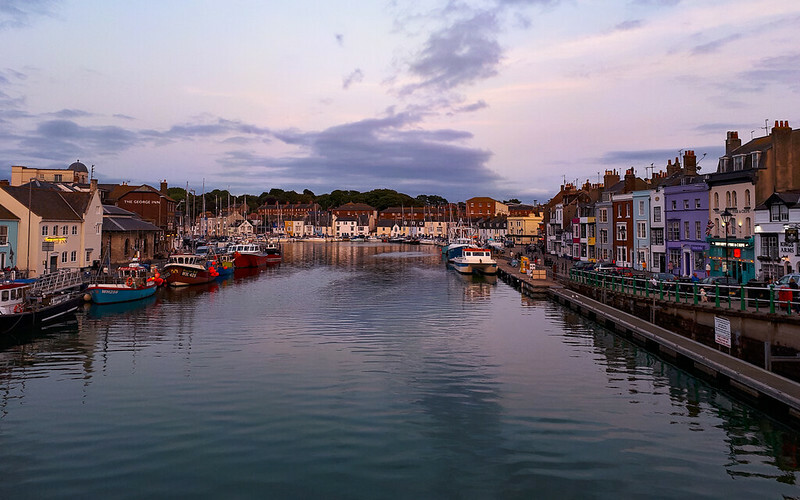 Arriving into Weymouth was a real highlight, smells of fish and chips wafting as I walked around the harbour, filled with people and boats. Also, Weymouth is the first sandy beach on the hike. Top tip – take your boots off and walk along the sandy beach, it feels amazing! This part of the hike is one of the most popular section of the Jurassic Coast walk, but it’s beautiful so you can see why. Durdle Door, pictured above is the iconic photo which you will see on most websites and social media when anyone mentions the Jurassic Coast. Although it is stunning the walk up to the point and beyond are equally beautiful. 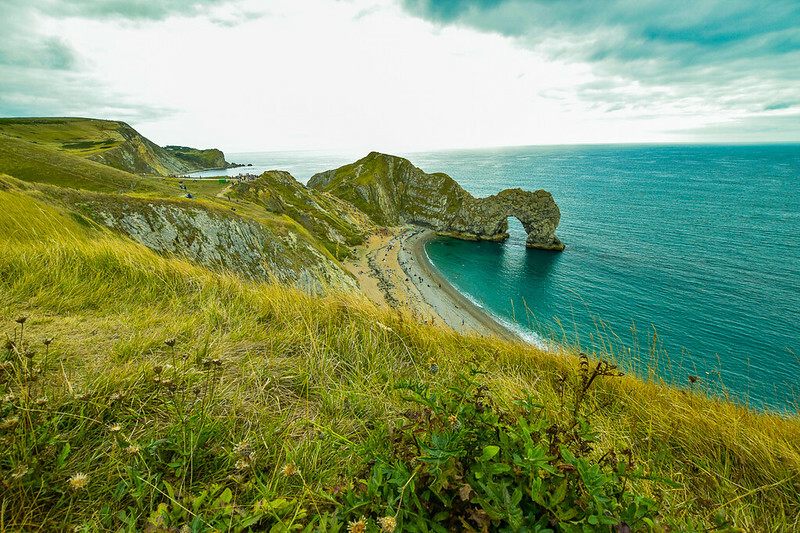 Top tip – Durdle Door is a beautiful spot on the Jurassic Coast but it’s very touristy. If you want to visit during quieter times then pick early morning or weekdays instead of weekends! From Lulworth Cove, you hike along the beach (the existing path along the ridge no longer exists and is blocked off). Take the path at the far end of the beach back up onto the cliffs for some beautiful views back to Lulworth Cove. Not much further along the Jurassic Coast walk, you will come across a stunning hidden cove called Mupe Bay. In peak season this is a much quieter beach to relax and it’s just as beautiful. Then there’s a really steep climb, taking you further up the cliffs. This is another section where there are limited options for accommodation and refreshments. Kimmeridge is a very small village about 1.5 miles off the Jurassic Coast walk. This is the end point for this section but up until here, there’s no-where to buy food or drinks so be sure to stock up before the hike. Where to stay in Kimmeridge? This is a long section but it’s difficult to split up this part of the walk. 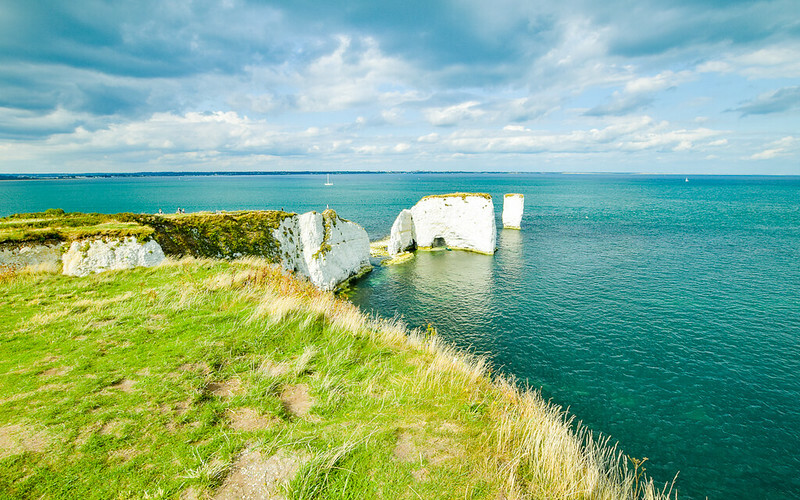 The final section from Swanage to Studland via Old Harry Rocks is about 5 miles so you could always make a half day hike on your final day. Durlston Castle isn’t like a traditional UK castle but it is a great spot to stop for a drink and from there you can see all the way to Old Harry Rocks. Due to the long distances between the accommodation for this part, it does make it more difficult to plan. Please consider how far you want to hike in one day and maybe plan a shorter walk for your last day. 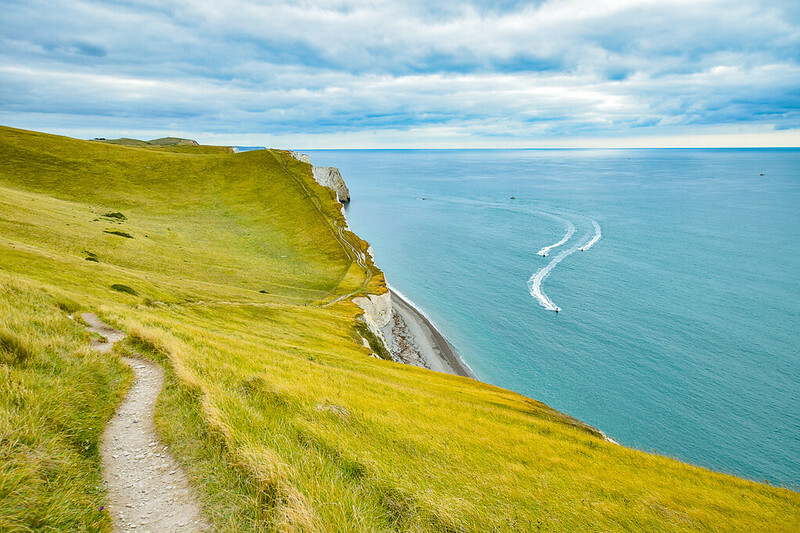 The Jurassic Coast path is part of a larger National Trail, the South West Coast Path. This trail is the longest National trail walk in the UK, a massive 630 miles/ 1,014 km. The benefit of this is that throughout the entire Jurassic Coast section there are well marked sign-posted and paths keeping you on track. Sometimes it’s a simple acorn sign (the oak tree is the national symbol in the UK) or signs that say South West Coast Path. Be sure to take a good compass with you. Of course, there’s also the fail-safe rule of keeping the sea on your right (based on walking from Exmouth to Studland!) But every now and again it’s good to double check the route, especially when walking through the seaside town sections. This is when I went wrong in both Lyme Regis and Swanage, basically because I was too busy looking at the scenery instead of where I was supposed to be going! 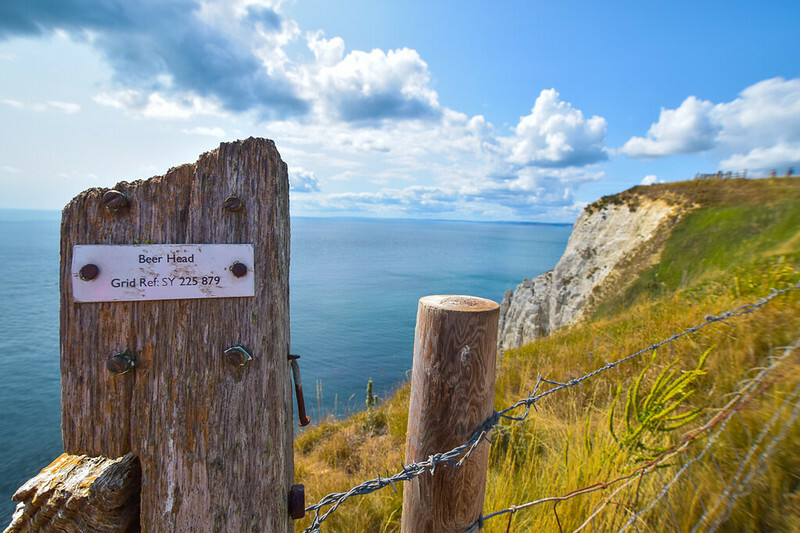 How to get to the start of the Jurassic Coast hike? Exmouth is a large seaside town, full of shops, restaurants and seaside accommodation. Depending on where you are travelling from you can arrive at the start and hike the same day or if you’re arriving later in the day then why not spend a night in this. Your options here depends on a few factors. Are you hiking solo or in a group? Do you know anyone in the area that can drop you off/pick you up? Are you travelling by car or public transport? 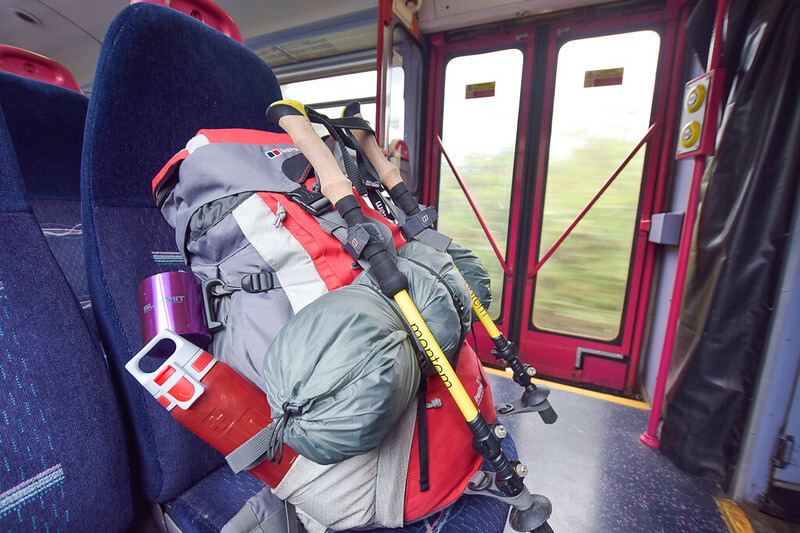 Hiking solo – if you are hiking the Jurassic Coast solo then public transport is the best way to get to the start point (and back again from the finish). Although, be prepared some of the public transport isn’t ideal if you also have a car. Hiking as a group – if you’re all driving, you could leave a car at the end of the hike, then have someone else drive back to the start. Although this is a 2-hour drive so factor that into your plans at the start and end of the hike. Plus you won’t be able to park exactly at the start and end locations and will need to pay for parking. Again public transport might be the best option. Living in the Midlands, I drove the 4-hour journey down to Dorchester, left my car and took public transport. This meant that I could leave my house at 6.30 am and be down south by 10.30 am. Yes, I could have got there by train at a similar time but peak train tickets cost between £96-£120 (one-way). My diesel car can do the 440+ mile trip for about £35 so a no-brainer for me travelling solo, without time constraints. 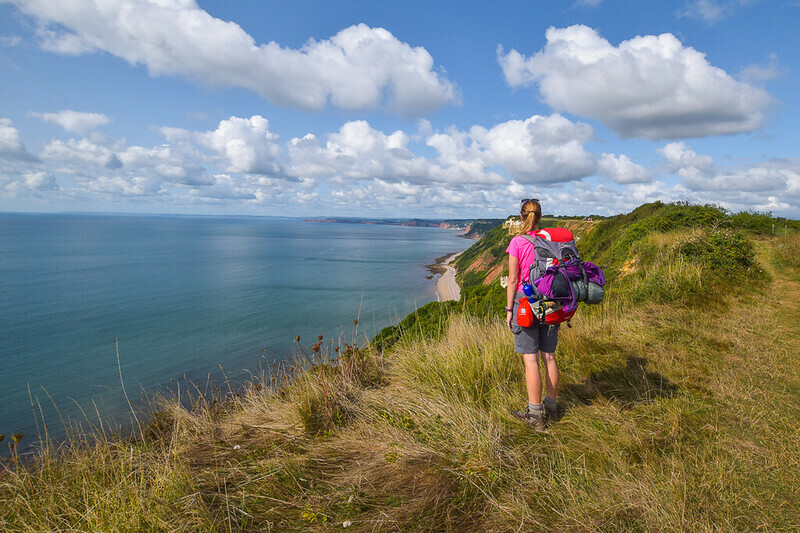 The official start of the Jurassic Coast path at Orcombe Point is about a 2-mile walk from the train station, along Exmouth seafront.ning of your hike will, of course, factor what you do at the end! 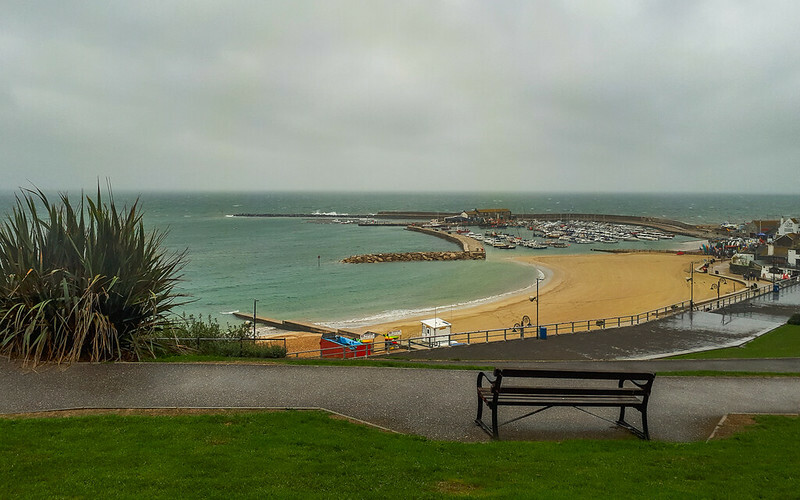 From the finish point at Studland, which is a small village, you can catch the Purbeck Breezer, which can take you to various destinations, including Swanage, Wareham, Dorchester, Poole and Bournemouth. Buy train tickets online via National Rail or you can buy them at the station (The price was the same for me). Due to finishing my hike late on the last day (due to blisters). I changed my plans and stayed at my auntie’s for a night as I would have missed the last bus (X11 back to my car outside Dorchester). My connecting bus to Wareham went 5 minutes earlier so I had nearly an hour wait. * Please note all costs and times are correct at time of writing. Please double check before you travel. Where to stay on the Jurassic Coast? 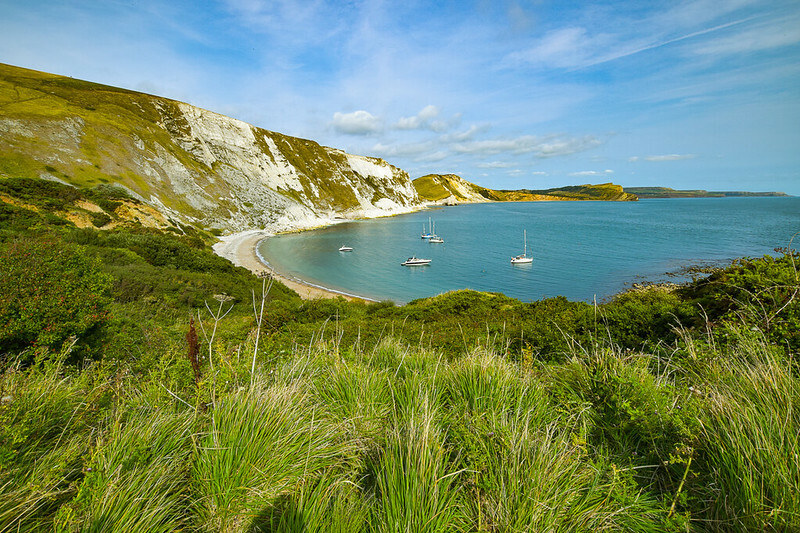 The Jurassic Coast has plenty of seaside towns and places to stay at the beginning of the hike. Although, towards the later stages there are fewer options so best to plan your route and where you are going to stay in advance. Since I was completing the route over a shorter period of time I opted to wild camp along the trail. If you’ve not tried wild camped in the UK before then please read my post here about top tips for your first wild camping experience in the UK. 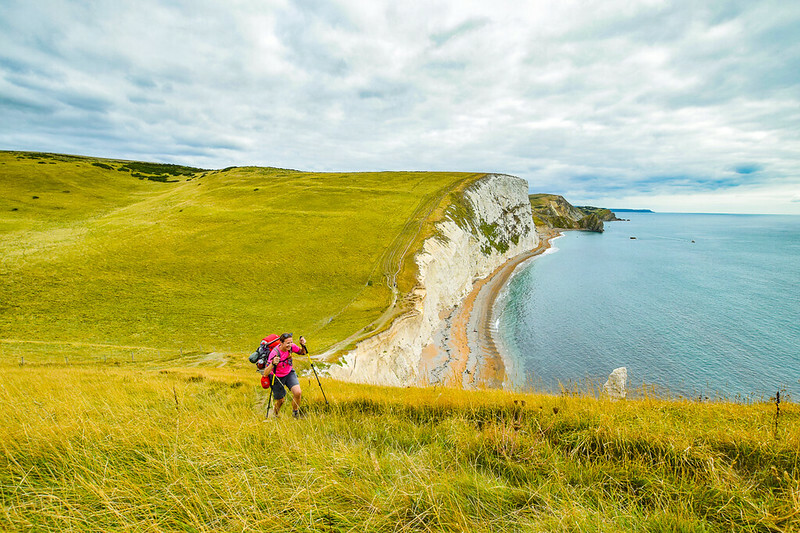 What Gear Do You Need For The Jurassic Coast Hike? Read my post on what to take on a day hike here. Are you interested in completing the Jurassic Coast walk from Exmouth to Studland? 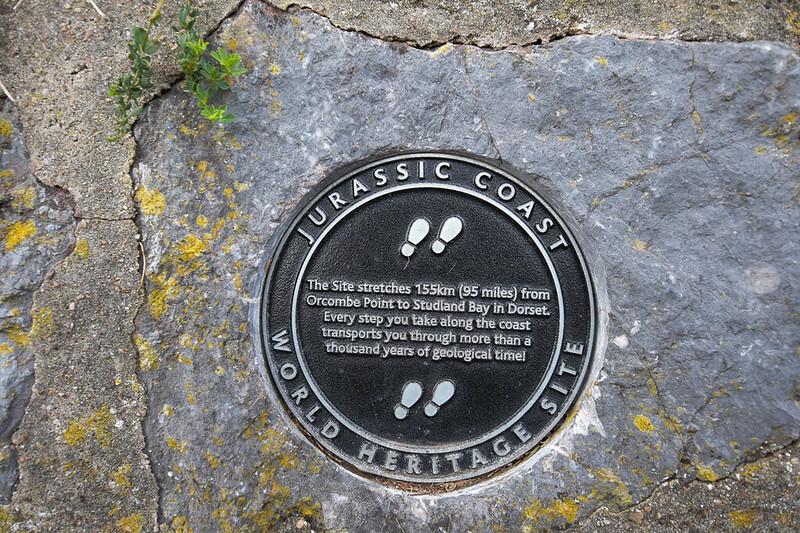 Do you have any more questions about completing the walking the Jurassic Coast? Ask me in the comments below. *20% discount correct at the time of writing. 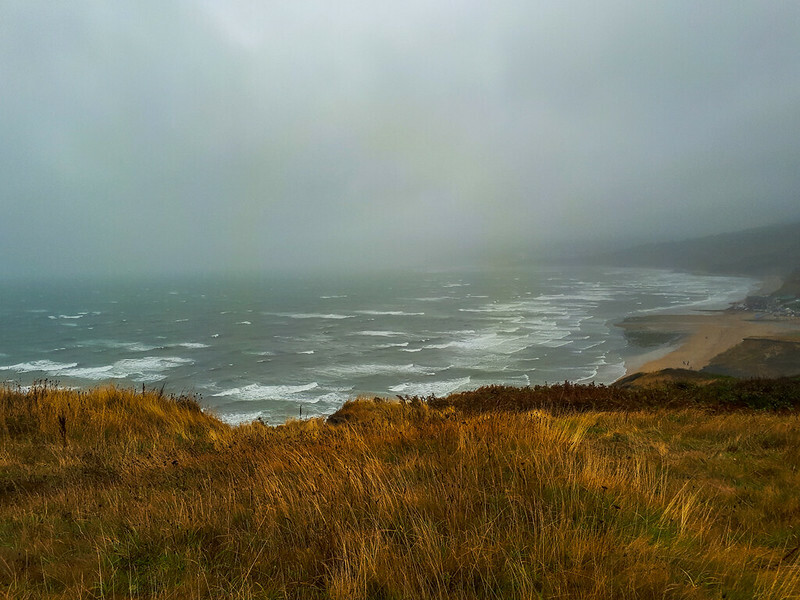 Looking at your photos make me agree with what you wrote: ‘Jurassic Coast walk is a real treat’. The place is so pretty! Thanks for this! Will be saving it for later. Loved the detailed of the hike and the name Jurassic Coast is quite interesting. Loved the article. Thanks so much, are you planning to do the hike?